June 1 - Siemens Industry, Inc. has been awarded its first North American streetcar order with a $17.2-million contract for four new cars based on the S70 Avanto light rail vehicle platform. They will be used on a 2.6-mi. (4.2 km) starter line in downtown Atlanta, linking the Martin Luther King Jr. Center with Centennial Olympic Park. Last March the city council approved $9 million to supplement a $47-million federal economic stimulus grant, allowing the purchase of new rather than second-hand vehicles as originally planned. The first 70-percent low-floor S70 is expected to be delivered in September 2012 but revenue service won't begin until early 2013. "The Atlanta Streetcar project will keep the City of Atlanta competitive with other cities by improving our transit connectivity, boosting our tourism industry, helping local businesses, and building a more sustainable future," said Mayor Kasim Reed. "Our agreement with Siemens will ensure that we have modern, world-class vehicles along the route to serve Atlanta residents and visitors for years to come." At 82 ft. (25 meters), the cars will be the same length as the 57 "ultrashort" S70s on order for the San Diego Trolley. The width of the Atlanta cars will be 8.5 ft. (2.6 meters), 6 in. (150 mm) more than the ultrashorts, providing a crush load capacity of 200. They are to be built at the Siemens plant in Sacramento using propulsion systems and other major components manufactured at the company's factory in the Atlanta suburb of Alpharetta. The contract was awarded by the Metropolitan Atlanta Rapid Transit Authority (MARTA), on behalf of the City of Atlanta and the Atlanta Downtown Improvement District. Civil works for the line are expected to begin this fall. Atlanta scrapped its first-generation streetcar system in 1949. 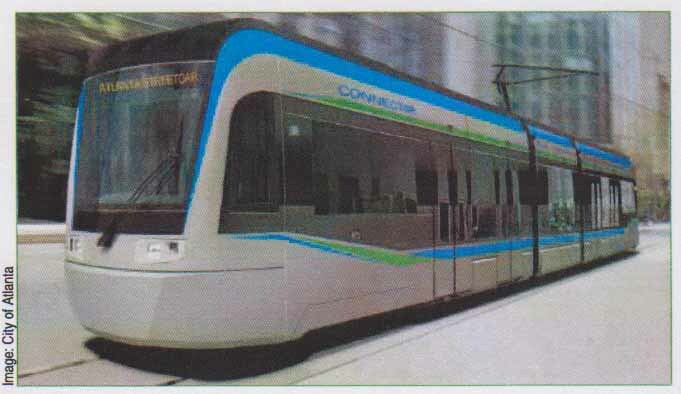 June 15 - A revitalization fund that City of Atlanta Chief Financial Officer Joya De Foor assumed contained $8.5 million, part of which was needed for the downtown streetcar, was found to be empty, the money having been used to balance the 2009 municipal budget. The city plans to make up the shortfall with revenue from a $6.67-million land sale. Constitution. "Somebody told her that the money was there." The FTA was assured the local match was available when it awarded Atlanta a $47.6-million grant for the streetcar, which will connect the King Historic District to Centennial Olympic Park.